Toblerone Tiny Crunchy Almonds – one of the most successful flavors is now available in a new format! 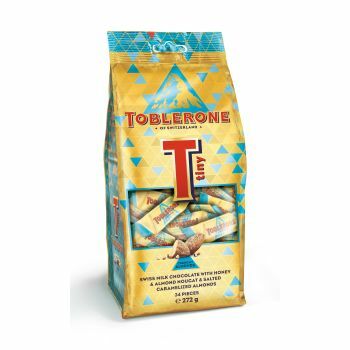 The iconic triangular milk chocolate with honey and almond nougat enriched with crunchy caramelized almonds and a drop of salt offered in a shiny, travel exclusive blue and golden bag of 34 individually wrapped snack-sized pieces. Perfect to share with your loved ones.